Behold! This is eight layers of magic right here. 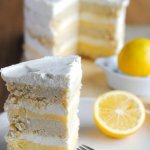 Coconut cake, lemon curd and an airy cream cheese frosting; I actually gasped when I cut in to it and saw the beautiful layers. I truly had a moment. This cake is styled after the cakes at Momofuku Milkbar. It takes a lot of steps to put together, but the results are worth it. If you start reading this recipe and decide it’s too fussy, you could always just use the components to make a trifle. It will taste just as good! To make this cake the way I did, you will need a 9×13 sheet pan, a 6 inch cake-pan or cake-ring and cake collars (acetate strips). Are you already rolling your eyes? I’m sorry! 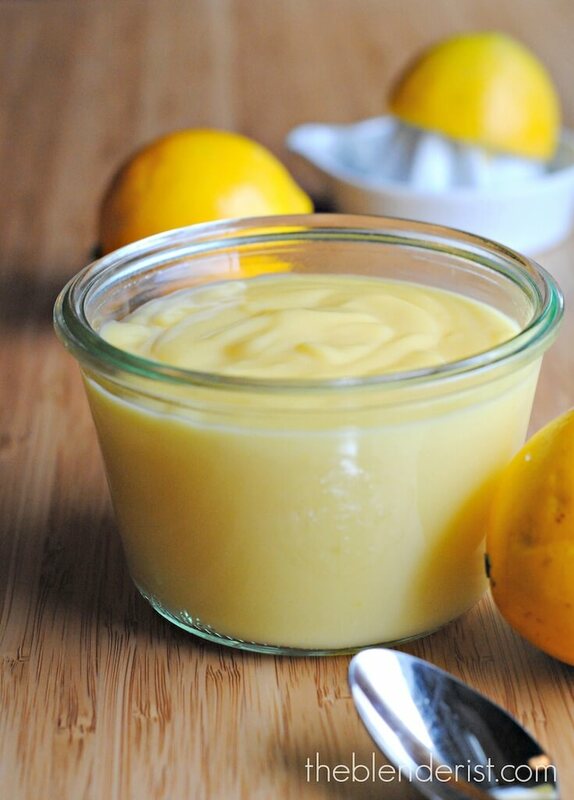 The first thing you want to make is the sugar-free lemon curd. I posted the recipe here. 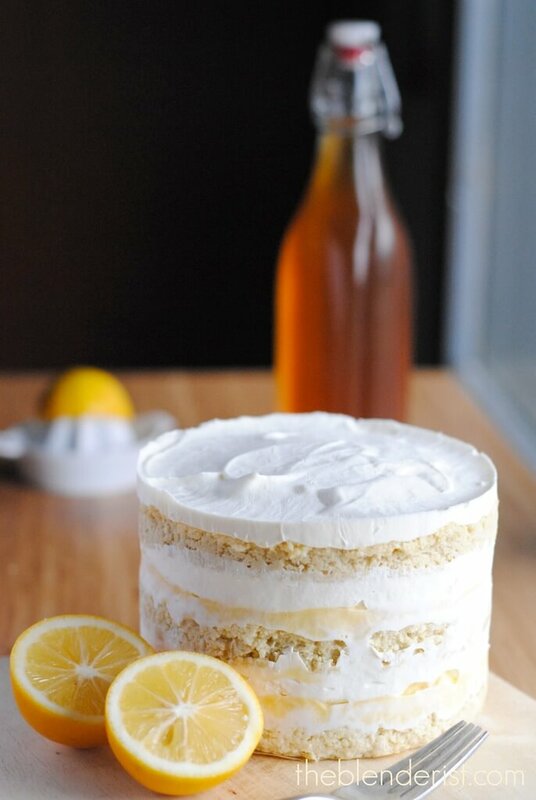 When you make that recipe, save the extra egg-whites to use in your coconut cake. The second thing to make is the gluten-free coconut cake. The recipe for that is here. When you make that recipe, set aside the leftover coconut milk. Once you have those two components cooled and ready to go, you can make your sugar-free cream cheese frosting. I’ve included that recipe at the bottom of this post with the rest of the instructions. 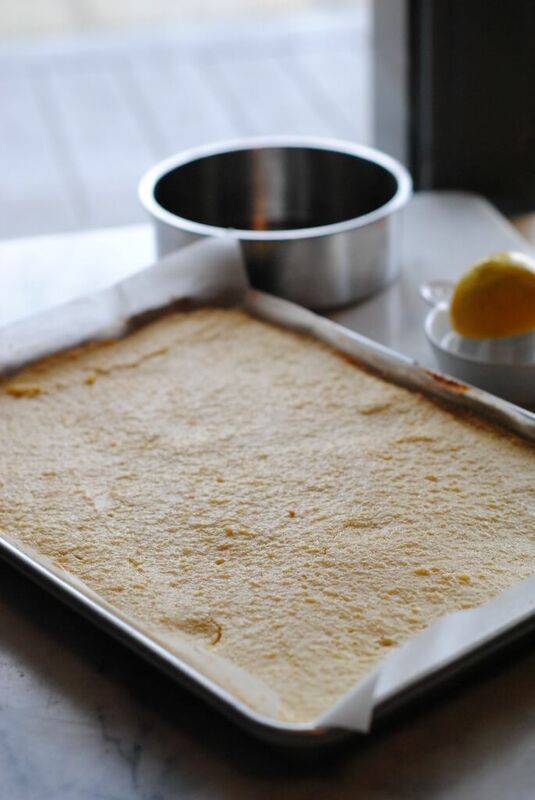 Once your cake is completely cool, you can remove it from the sheet pan. I flip it over on to a cutting board. Then, using the cake ring or cake pan, cut out two full circles and two partial circles. Clean the cakepan or ring and line the bottom with a circle of parchment and line the sides with an acetate cake collar. You are going to build a cake that is taller than the cake pan, so you need to use the acetate to build it up. I should have taken more pictures of that process, but I forgot! 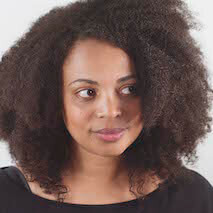 So, here is a blog I found with some great pictures of the layering method. It’s called Margaret in the City. 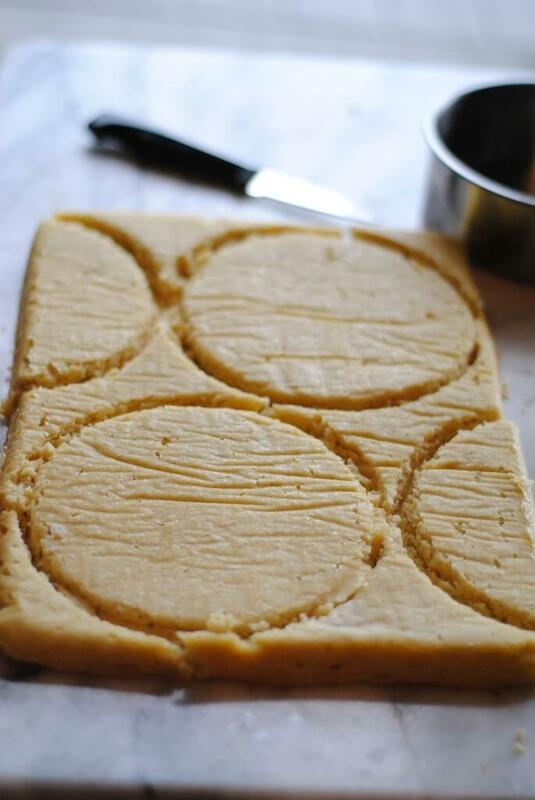 The first layer of your cake will be made with the semi-circles you cut up. Don’t worry if they don’t add up to a full circle. Press them right in to the bottom of the pan and fill the middle with cake scraps. No one will know the difference! Try to make it an even surface. Using a pastry brush, soak the first layer with some coconut milk. You don’t want it sopping wet, but be generous. This is going to make your cake nice and moist. Next, spread half of the lemon curd in an even layer. Then a thick, even layer of the frosting. Put one of the cut our circles of cake on top of the frosting layer and press it down gently. This is when you will want to add another piece of acetate to build up your pan, if you haven’t already. 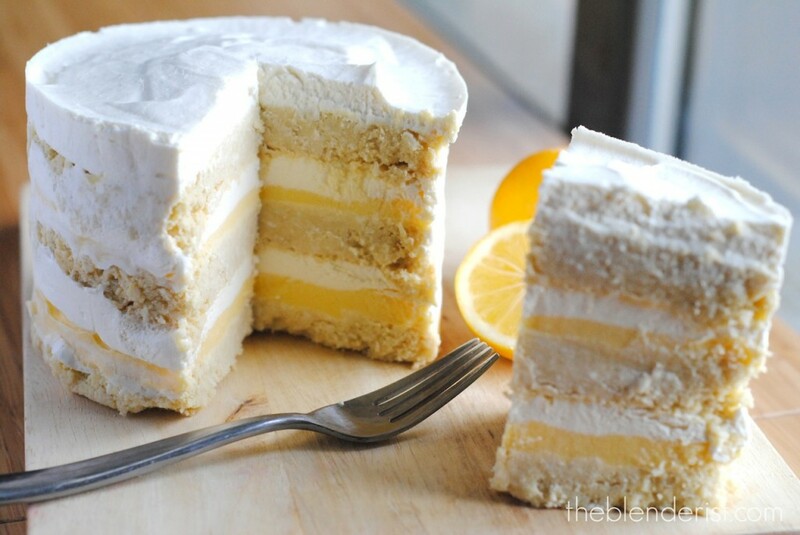 Soak this layer with coconut milk, spread on the rest of the lemon curd and add another even later of frosting. Put the last circle of cake on top. Don’t soak this layer. Put the frosting right on top. Put the whole thing in the freezer overnight. When you take it out of the freezer, it might have some tiny cracks in the frosting. Try not to let it bug you. Defrost it in the fridge for several hours before serving. Prepare the Lemon Curd and let it chill. Prepare the Coconut Cake and let it chill. Whip the cream until peaks form. In a blender, mix the cream cheese, coconut milk, vanilla and sweetener until smooth. Test the sweetness level at this point and add more sweetener if you prefer a sweeter frosting. Fold the cream cheese mixture in to the whipped cream until it is completely incorporated. Remove your cake from the sheet pan. Press your 6 inch round cake-ring or cake-pan to cut out two full circles and 2 half circles. Clean the cakepan or ring and line the bottom with a circle of parchment and line the sides with an acetate cake collar. Press the two half circles right in to the bottom of the pan and fill the middle with cake scraps. Using a pastry brush, brush the first layer with some coconut milk that you reserved from making the sheet cake.This will keep the cake moist. Next, spread half of the lemon curd in an even layer. On top of that, spread an even layer of frosting. Put one of the cut our circles of cake on top of the frosting layer and press it down gently. Tuck another piece of acetate in to your cake pan to build the sides up another 2 or 3 inches. 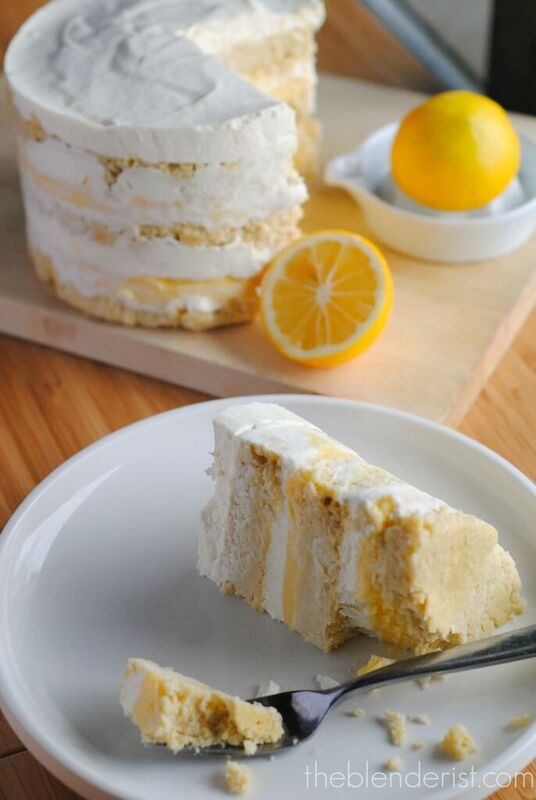 Soak the top layer of cake with coconut milk, spread on the rest of the lemon curd and add another even later of frosting. Put the whole thing in the freezer overnight. Take it out of the freezer and pull off the pan. Defrost in the fridge for 3 hours before serving. *I went very easy on the sweetener in my frosting. I wanted it to be like a slightly sweetened whipped cream instead of a sugary cream cheese. After several hours in the fridge, I noticed a little bit of weeping at the bottom of the cake. I just moved it to another plate, and everything was fine. It lasted very well for 3 days in the fridge. If you need to save it for longer, keep it in the freezer. I cannot even believe this! 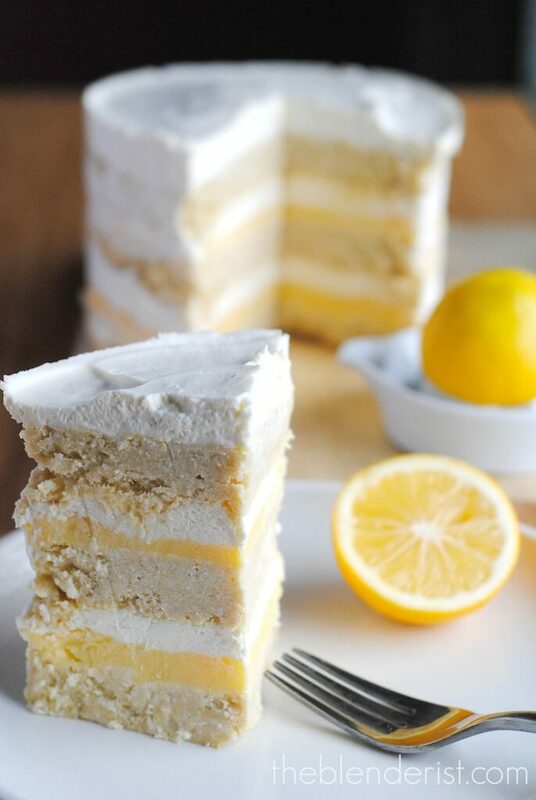 I swear, I could eat the whole thing in one sitting – I am having a slight love affair with lemons right now. Add cake & curd and I’m in! I hear you! It didn’t last long around my house! Tonight I started on this dessert for my hubby’s birthday cake. I’m wondering, have you ever calculated the nutritional details on this recipe? When time permits, I will certainly do it. However, if you have done it already and don’t mind sharing it I would greatly appreciate it. BTW- I’ve doubled the recipe, used 10″ cake pans with the three cake pieces being about 1″ thick. I am making a 10″ cake hoping to serve 16-20 people. Just for giggles, I made one 3″ springform pan of the cake. IT IS MARVELOUS! Cannot wait to sample the final product! I’ve never done the full nutrition breakdown, but I believe it has 8 net carbs per serving when divided in to 6 servings.You can try punching your quantities in to this counter http://caloriecount.about.com/cc/recipe_analysis.php …it should give you a pretty accurate idea based on the ingredients you used. I’m glad to hear you liked the sample bit you tasted! If you take a picture of the finished cake, I’d love to see a picture!